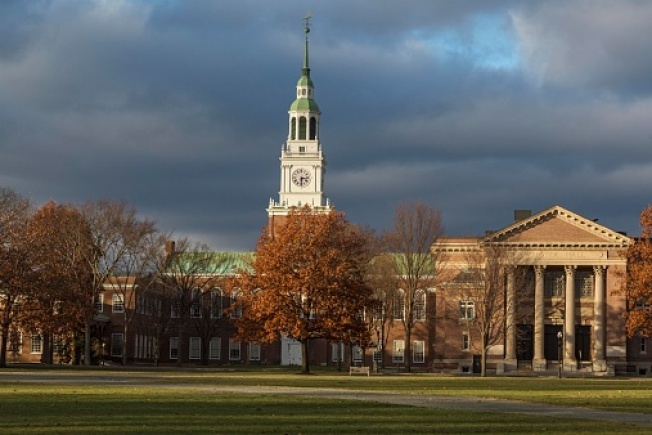 A Dartmouth College fraternity put on probation three years ago for expecting pledges to drink saltwater and enter a kiddie pool filled with condiments is under investigation again for hazing. The national Sigma Alpha Epsilon organization released no details, including what the supposed hazing was or when it happened, but said Monday it notified college administrators of the allegations and immediately ordered the Dartmouth chapter to suspend all activities. The Dartmouth chapter didn't immediately respond to an email message seeking comment. A spokeswoman for the college confirmed that officials are cooperating with the national organization and police, but she declined to comment further. In April 2012, a Dartmouth judicial panel found the fraternity guilty of hazing for driving blindfolded pledges off-campus in 2009, expecting them to drink shots of saltwater or alcohol and expecting them to enter a kiddie pool filled with condiments. But the panel said there was not enough evidence to back up more egregious allegations made by a former member who described "dehumanizing" experiences at the fraternity. In a column for the school newspaper, Andrew Lohse said the fraternity pressured pledges to swim in a kiddie pool of rotten food, vomit and other bodily fluids; eat omelets made of vomit; and chug cups of vinegar. The fraternity was put on probation for three terms and members were ordered to participate in educational programs. Based on Lohse's allegations, Dartmouth charged the fraternity and 27 students, including Lohse, with hazing but later dropped the individual charges. Brandon Weghorst, spokesman for the national organization, said Sigma Alpha Epsilon has a "zero-tolerance policy for any actions or behaviors that deviate from our policies, mission and creed - because that type of conduct is unacceptable." Weghorst said the fraternity has offered an anti-hazing hotline for many years, and earlier this year, created a new anonymous hotline to allow anyone to report inappropriate, offensive or illegal behavior to the national organization.